Feng shui is an ancient Chinese discipline based on the orientation and placement of everything in existence. The primary principles of feng shui are meant to bring balance and harmony to you and your surroundings through the positive flow of Ch'i, the energy or life force responsible for the vitality of the world. In this belief system, Ch'i flows throughout every fiber of reality, including all living things, the land itself, the sun, and the stars. In the contemporary world, feng shui is generally used as a guide for the orientation of buildings, furniture, and decorative items. The art of feng shui has been in use for thousands of years, and the exact origin point is debated amongst historians. Some claim the first instance of proof can be found dating from 3,000 BC, while others believe evidence of its practice have been found from as early as 4,000 BC. Before compasses were invented to show the cardinal directions so often relied upon in modern feng shui, practitioners relied on astronomy to guide their orientations. At a certain point in history shortly after the discipline took root, every single Chinese capital city was organized by the rules of feng shui. The concept of feng shui is derived from the phrase's literal meaning, which is ‘wind and water'. The flowing nature of these elements is meant to convey the connection between man and his environment. The goal of feng shui is to tap into the positive Ch'i surrounding you in order to block the negative Ch'i, and in so doing, maximizing the positive effects of flowing Ch'i. Chinese tradition holds the belief in Ch'i as an inherent truth. It's a fundamental force that reaches into the very depths of reality, touching everything and everyone. Feng shui originally grew as a unified way of examining the environment in order to find the most positive location possible for whatever function was needed. It was meant as a way to ensure the utmost harmony with nature by describing optimal natural order. The first text describing a system of categorizing the scenic southern mountain formations was a manual compiled by Yang Yun-sung, and that text went on to be the basis for the Form School of feng shui. Later, devoted practitioners in the north created a system of cataloging feng shui in the flat plains of their homeland with the help of a compass. This led to the creation of The Compass School of feng shui. Modern feng shui experts take aspects of both systems to better form an opinion of the environment's energy flow. The practice of feng shui is based on several underlying principles that act as the basis for many Chinese belief systems. Today, feng shui is used to find the ideal locations and orientations of new manmade structures based on the Ch'i of the location. Below is a brief outline of the principle beliefs involved with feng shui. Ch'i (Qi): Ch'i is one of the oldest concepts in Chinese history. It is defined as a background life force, a flowing negative or positive energy that interacts with all existence. In modern feng shui, masters of the art will test a location for a number of factors that indicate the quality of the Ch'i in an area. These details might include what the structure is going to do on the location, what direction it should face, how it relates to the environment, and so forth. It has been suggested that Ch'i is a form of solar radiation that flows through the atmosphere. If that were the case, the practice of feng shui with the aid of a compass would have a real and measurable affect on the new structure. Ch'i has even been connected to the force of karma, often overlapping positive areas of one another. Bagua: The Bagua is a single diagram that represents the fundamental properties of the universe, described through the combination of eight similar ideas. These eight components are presented as trigrams composed of three lines of varying lengths. The lines differ by being either broken and unbroken, which mirrors the opposing nature of yin and yang. Traditionally, the relationships between these trigrams are aligned in two arrangements. They are known as the Earlier and Later Heavens. The first is used to calculate the value of a location as a burial place, and the latter is used for homes and other buildings. Polarity: Yin and yang are the two primary modes of polarity used in feng shui. The symbolism is similar to the opposite poles of a magnet, whereby two opposing forces are acting against one another. The concept is expanded within the five elements theory, which goes to further explain the nature of reality as it relates to the interaction of fundamental forces characterized by common substances: water, wood, fire, metal, and earth. These forces interact with each other in ways that offset and cycle, just like yin and yang. Feng shui practitioners can use the knowledge of how these elements interact in specific locations to determine if any orientation changes are required. Only when the five elements are properly balanced will the optimal flow of Ch'i be achieved. 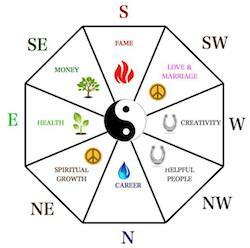 The two most widely practiced schools of feng shui are the Form School and the Compass School. Both schools have their own techniques for determining the energy flow in any given area, but they do so in very different ways. The Form School relies heavily on the surrounding landscape, focusing on the orientation of hills, mountains, rivers, lakes, and any other nearby formations. In doing so, the hope is to bring balance to the natural environment. The techniques involved use several of the primary underlying beliefs of feng shui. The opposition and balance of the yin and yang principle is careful considered, as are the five elemental forces of water, earth, metal, fire, and wood. The Form School also follows principles based on the five Chinese celestial animals, which are the white tiger, the yellow snake, the black turtle, the green dragon, and the phoenix. The Compass School primarily uses techniques that take advantage of a compass to assess cardinal directions. According to Compass School experts, each of the cardinal directions is associated with its own specific type of Ch'i. Practitioners use a special compass, called a Luopan, to gauge the energetic level of an area. This school was first utilized in the northern areas of China, where flat plains ruled the landscape. They needed a focal point for their feng shui that didn't involve the relationship between landmarks, so they created the system that builds from the Earth's natural magnetic field. The primary tool of the Compass School, the Luopan, functions nearly identically to a polar compass, except a Luopan points to magnetic south as opposed to magnetic north, like a traditional compass. Feng shui has received a lot of criticism from the western world regarding its effectiveness in creating balance and harmony. There are many who tout it as no more than a modern fad or money-making scam, whereby feng shui ‘masters' provide their specialized services to gullible yet wealthy clients for large sums of money. The truth of the matter is that many feng shui practitioners are sought out because their opinions actually produce results. The reason for this is that feng shui is really no more than a set of metaphors that describe ideal architecture. 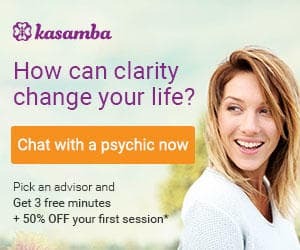 A feng shui expert will go through a process of determining the value of a building in the same way that an architect might, but only with profoundly different techniques. Visualization techniques are often used to help get a better idea of the natural flow of a floor plan. In terms of the location relative to the surrounding land, a feng shui expert might visualize the building from multiple orientations in an attempt to deduce the most favorable. In short, the techniques used by feng shui masters are meant to find and implement aesthetic and structural architectural details that will appeal to the average sense of comfort. Many lower class Chinese families are unable to make significant changes to their living space due to financial constraints, which leads to a lack of faith in the idea of feng shui. Those higher forms of feng shui are only achievable by the wealthy class, but there are other forms of feng shui that aren't as expensive. These cheaper forms rely on specific objects placed in proper alignment with the rest of the home, and in doing so they deflect negative Ch'i. Other simple feng shui techniques have sprung forth to fill the need of those who can't afford to hire a master. They involve do-it-yourself changes to the home via the addition of symbols that represent the five elements. By arranging these items in a proper way, the home can experience a productive-cycle environment that promotes positive Ch'i. The practice of many different forms of feng shui remains popular in Chinese culture, and many professionals from other disciplines study the art at least on a part time basis. Some of these professionals include architects, engineers, and designers, all of whom understand the importance of balance and harmony as it relates to their work, and the entire world. Feng shui will continue to have an impact on the way people design and orient their constructions for as long as there are those who believe in the value of such disciplines. What Are The Five Chinese Celestial Animals Of Feng Shui?